Ra’Shede Hageman: Highly skilled, high effort? My look around the rookie IDP fantasy landscape continues with defensive lineman Ra’Shede Hageman. Grabbing IDPs before they make a big impact can be the difference between winning your fantasy league and even making the playoffs. Depending on the day and his effort-level, you could see a superstar in the making or just another big body with the former Minnesota prospect. 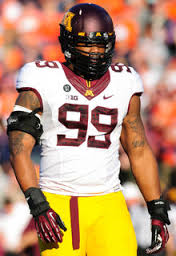 I got to watch him practice during the Senior Bowl week and reviewed four of his 2013 college games against Wisconsin, Northwestern, Penn State, and Iowa to get good comparisons of what Mr. Hageman can and cannot do. He found himself in a great spot, the Atlanta Falcons, to get some early playing time and be a contributor this season. Rawness and brute strength ooze from Hageman. The defender gets too high off the snap of the ball, and gets knocked off-balance a great deal of the time. Even though Hageman played every position on the defensive line, at times, his balance issues almost guarantee that he will not become a nose tackle. Smaller centers and guards should have no trouble getting beneath his pads to move him around the line of scrimmage. Despite the balance concerns, his power and strength typically demand double teams regularly. Even with his brute physicality, Hageman allows offensive linemen to get into his body and his effort varies from play to play. When the defender is on his game, he is difficult to block causing havoc both in the running and/or passing game. He has a tendency to tackle either high or low, when a man with his strength and power could lay an offensive player out with a nice hit to the midsection. Hageman gets good initial burst off the line of scrimmage, usually getting his blocker off his feet, and sometimes employing a spin move that is effective to create space. It’s concerning that I saw him use a spin move only five times in the four games I watched. The defender usually times his jumps well and can knock down passes right at the line. Hageman sometimes gets too focused on one player and doesn’t adjust quickly to misdirection. With someone his size, the defensive lineman needs to see the field better. He can drop back into coverage in a pinch. There was one play that Hageman did just that and he batted the ball in the air only to come down with the interception while rumbling 30 yards down the field. He would be best rotating playing both three and five techniques to disrupt the passing game and anchor on the offensive line against the run. Hageman is so raw that dynasty fantasy owners will need to be very patient with him. I would not want him on my team higher than a DT3/DE4, but I believe in time that he could become a weekly starter. Please support the site, use the PayPal donation button today. « Justin Gilbert: A star in the making?